What do you get one risk-taking entrepreneur wants to make it to the top of the small business world? Bob's Burgers, the newest animated series to join the Sunday night lineup on Fox. 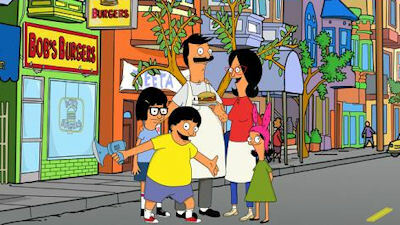 Bob lives out his dream by running his own burger business, appropriately called Bob's Burgers, where he uses (or perhaps abuses) his wife Linda (John Roberts) and three children, Louise (Kristen Schaal), Gene (Eugene Mirman) and Tina (Dan Mintz) as the employees of the joint. It isn't the most smoothly run joint around, and disasters are abound everywhere in the place... but Bob is determined to prove that he has what it takes and come out on top in the end. H. Jon Benjamin (Bob Belcher) plays the patriarch of the family. He is known for many voiceover roles in other adult animated series, including his roles as Jason and Coach McGuirk in the series Home Movies, Benjamin (Dr. Katz's son) in Dr. Katz, Professional Therapist, and Sterling Archer in Archer. Additionally, he has played other guest roles on animated series including Family Guy, The Venture Brothers, Assy McGee, and Space Ghost Coast to Coast. He also had a regular role on the Comedy Central series Important Things with Demetri Martin and is working on a new sketch comedy show for the series called Jon Benjamin Has a Van. John Roberts (Linda Belcher) is most certainly a male, but he plays the mother on this series. It isn't a role that he is necessarily new to, however. He has also played the role of Jimmy's mother on Late Night with Jimmy Falon. Much of Roberts' fame comes from his YouTube viral videos, including "The Christmas Tree" and "Jackie and Debra." Kirsten Schaal (Louise Belcher) plays the youngest daughter of the family. Schaal is a comedian who does a lot of stand-up comedy, but is probably best known from her hilarious role of Mel, Bret and Jermaine's stalker/only fan on the HBO series Flight of the Conchords. She has also appeared on the Comedy Central series The Daily Show as a special commentator, and her movie credits include Dinner for Schmucks, Kate and Leopold, and Norbit, among many others. Additionally, she has appeared in guest roles on TV series including Modern Family, Law & Order: Criminal Intent, Ugly Betty, How I Met Your Mother, and Mad Men. Finally, she was credited as a consultant and writer in the eleventh season of South Park. Eugene Mirman (Gene Belcher) plays the son of the family, and also has a bit of fame from some of the same series as the other cast members. He played the landlord on HBO's Flight of the Conchords and also made appearances in Home Movies, Aqua Teen Hunger Force, Third Watch, and more. He has also toured as an opener for the Flight of the Conchords and other stand-up comedy acts. Dan Mintz (Tina Belcher) is another male in a female role, playing the eldest daughter of the Belcher family. Mintz is known as a stand-up comedian, but he is more known as a writer for comedy series, including Crank Yankers, Last Call with Carson Daly, The Andy Milonakis Show, and Important Things with Demetri Martin. Bob's Burgers is ready to open... then there is a series of disasters that stop it... but eventually, the business is up and running and Bob and the rest of the Belchers are ready to go. Or so they hope, at least. The first day starts out with Bob leaving the kids in charge of the restaurant while he and Linda go to the basement to grind the meat (meaning the hamburger, by the way). Tina has a rash in an unmentionable place, Louise wants to use the opportunity to run the restaurant as she sees fit, and Gene, well, he wants to be just plain obnoxious. With the parents out of sight, the city health inspector comes in after hearing a report that the joint was serving human remains in their meat, mostly because little Louise decided that it would be awesome to tell her classmates that they served human remains in the burgers. The timing is even worse when Louise changes the special of the day to the "Child Molester Burger" and Tina is seen at the grill scratching herself uncontrollably. Meanwhile, Bob and Linda are down in the basement and Linda gets a bit upset because Bob didn't remember that it was September 3rd--the date of their anniversary. Bob says that a special surprise is on the way, but when Linda goes upstairs, she finds a surprise that she didn't quite expect, the health inspector (also the man she was engaged to at one point in time) who actually DOES remember her anniversary (who could forget 9/3, because nine is divisible by three?). The health inspector is kind enough to not shut down the restaurant, but does put a warning label in the window that the restaurant "may serve" human flesh, and he puts a damper on the opening weekend by saying that he won't be able to test the meet to disprove the rumor until Monday. Bob and Linda are determined to make it through this mess no matter what, including Bob intimidating the health inspector, Linda pretending to rekindle her old flame with him, and even offering $50 burgers to "adventure eaters" interested in actually eating human flesh. In the end, all turns out well for the burger joint, at least this time. The pilot, "Human Flesh," is not exactly a well-done burger. The series isn't quite as bad as I thought that it would be, but a weekly series about running the burger joint just doesn't feel like it will work. It might be more interesting if they'd put in more of what goes on in the family home life, or added in other employees to create a more dynamic cast (the pilot focused almost exclusively on JUST the family, with the exception of the health inspection team). The humor of the series isn't bad, but could use some improvement. Much of the humor comes from the youngest daughter, Louise, with her invention of the child molester burger, the fabrication of the rumor of the "human flesh," and other smaller moments such as trying to determine if older sister Tina is autistic by having her count toothpicks that fall on the floor (there are three in total). Still, there are no laugh-out-loud moments in the pilot, and it could definitely use some of those moments. Not all is negative about the pilot, though. The family on the series is well-cast and they all work together very well. Even the males playing the female roles fit in to their roles very well. The series has a great family dynamic, but putting the family in a different environment besides just the family restaurant would be nice to see in some of the future episodes. The series COULD (and I stress, COULD) have potential to make it as a decent series, but the ins and outs of a burger joint are hardly enough to make an entire series. An episode of a series about running a burger joint could make a good episode, but I don't know where the humor and fresh "raw" material will come from in creating a weekly series that doesn't turn rotten. In the meantime, I'm going to take a cautious wait and see approach on the series. Discuss the show after you watch it on Sunday, January 9 on our message board. For the week of Jan. 10-14, 2010, we have many current sitcom stars and past sitcom stars on TV talk shows! So get your DVR's (or whatever you use) ready! Ready? Here is all what you need to know for the coming week! Roseanne Barr (Roseanne) - Watch Roseanne continue to promote her book, this time on Late Late Show with Craig Ferguson at 12:37am on CBS. Regina King (227) - Catch Regina on an all-new Late Night with Jimmy Fallon on NBC at 12:37am. Suzanne Somers (Three's Company/Step by Step/She's the Sheriff) - Catch Suzanne on NBC's Today Show and on a new LIVE! with Regis & Kelly so check your listings for time and station. The Cast of The Game - Watch the cast on a repeat of The Mo'nique Show at 11pm on BET but on a new episodes of The Wendy Williams Show at 12am on BET and your local stations! The series stars Tia Mowry. Jerry O'Connell (Carpoolers) - Catch Jerry on an all-new Late Night with Jimmy Fallon at 12:37am on NBC. Rashida Jones (Parks and Recreation/The Office) - Watch Rashida on Conan at 11pm on TBS. Roseanne Barr (Roseanne) - Roseanne will be on The Talk on CBS at 2pm ET/1pm PT-CT. The Cast of Let's Stay Together - After the sitcom premieres, catch the cast on The Mo'nique Show immediately following the premiere at 11:30pm on BET! Regina King (227) - Watch Regina on The Wendy Williams Show on BET at 12am or your local station. Kevin James (The King of Queens) - Watch the now movie star on NBC's Today Show then on the Late Show with David Letterman on CBS at 11:35pm. Rico Rodriguez, Nolan Gould and Ariel Winter (Modern Family) - Watch the kids of the sitcom on an all-new Jimmy Kimmel Live! on ABC at 12:06am. David Duchovny (Californication) - Watch David on Late Late Show with Craig Ferguson on CBS at 12:37am. Jerry O'Connell (Carpoolers) - Watch Jerry co-host with Kelly Ripa on LIVE! with Regis & Kelly, so check your listings. Courtney Thorne-Smith (Two and a Half Men/According to Jim) - Catch Courtney also on The Talk on CBS at 2pm ET/1pm PT-CT.
Suzanne Somers (Three's Company/Step by Step/She's the Sheriff) - Watch Suzanne this time on The Joy Behar Show at 9pm on HLN and then on The Wendy Williams Show, so check your listings or watch nationally on BET at 12am. Brad Garrett ('Til Death/Everybody Loves Raymond) - Watch big Brad on The Joy Behar Show on HLN at 9pm. Eric Stonestreet (Modern Family) - Watch the Emmy winner on The Tonight Show with Jay Leno on NBC at 11:35pm. Roseanne Barr (Roseanne) - Watch Roseanne this time on Tavis Smiley Show on PBS, so check listings for time. Ron Howard (Happy Days/The Andy Griffith Show) - Catch Ron on NBC's Today Show then in late night on The Daily Show with Jon Stewart on Comedy Central at 11pm. David Duchovny (Californication) - Watch David this time on Lopez Tonight on TBS at 12am. Kevin James (King of Queens) - Watch Kevin on LIVE! with Regis & Kelly, check listings. Terry Crews (Are We There Yet?/Everybody Hates Chris) - Watch Mr. Crews on The Wendy Williams Show on BET at 12am or your local affiliate as well. Candice Bergen (Murphy Brown) - Watch Candice on Late Night with Jimmy Fallon on NBC at 12:37am. David Duchovny (Californication) - Watch David on The Tavis Smiley Show on PBS so check when it airs in your market. Neil Patrick Harris (How I Met Your Mother/Doogie Howser MD) - Watch Neil on The Ellen DeGeneres Show, so check listings. Tatyana Ali (Love That Girl!/Fresh Prince of Bel-Air) - Watch Tatyana on The Wendy Williams Show at 12am on BET or your local station.